I made a deal with myself that I was not going to get involved with any big pumpkin projects this year, and I fulfilled my end of the bargain by doing a small one instead. 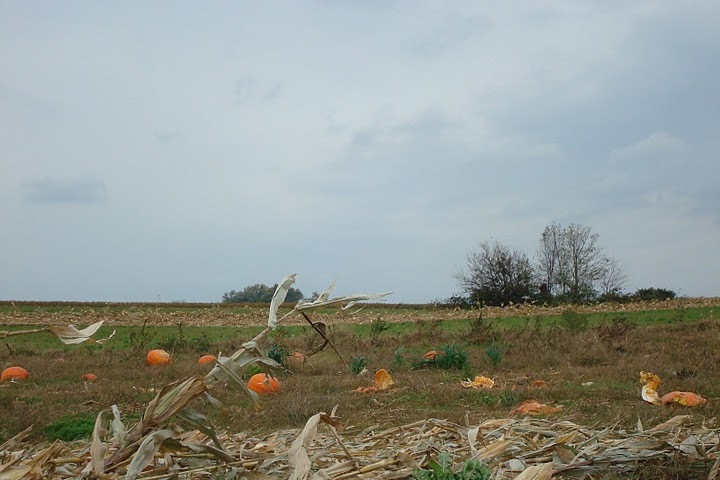 One of my favorite farm stands had a beautiful truck load of pie pumpkins (smoother skin, deeper orange color, a little sweeter than regular ones) so I bought two small pumpkins and donated a couple hours to them. What I coveted most was the seeds. 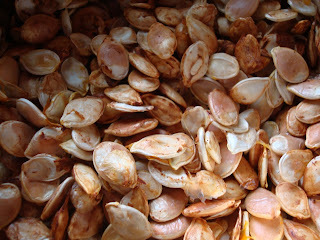 I love pumpkin seeds, especially sprinkled on salads or toasted with a little salt and seasoning. 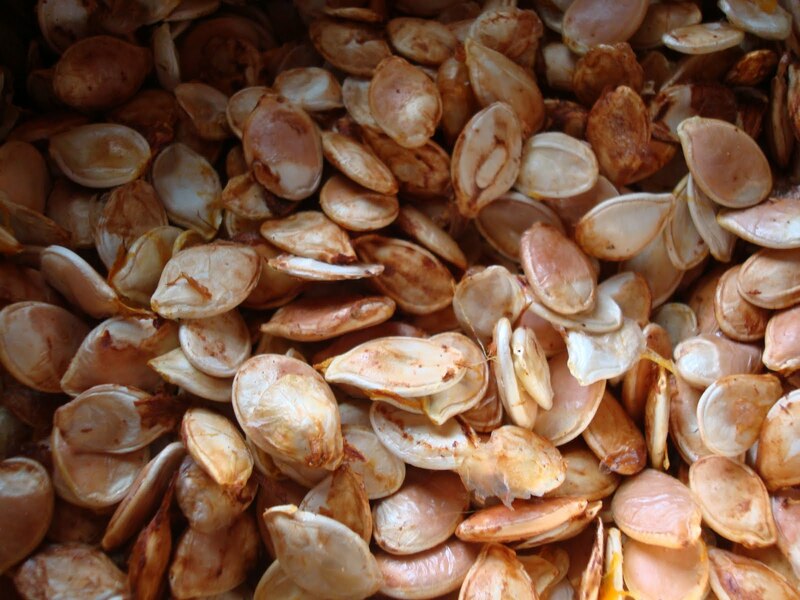 Last year when I went to buy some at the grocery store, I discovered that all of the pumpkin seeds were imported from China. This was the case at all of the stores I visited. What? You mean we don't produce any pumpkin seeds here? I'll never understand food politics. Anyway, pumpkin seeds are so good (and good for you) that it was worth the effort to harvest them. After separating the seeds from the stringy pulp, I spread them on my favorite magnum cookie sheet lined with foil that I sprayed with non-stick oil. Then, with a little seasoning salt and garlic powder, the seeds were roasted in the oven at 325 degrees for about 25 minutes, turning them every ten minutes. Oh, did they smell good! Just how autumn should smell, like wood and smokey leaves, and apple goody in the oven. 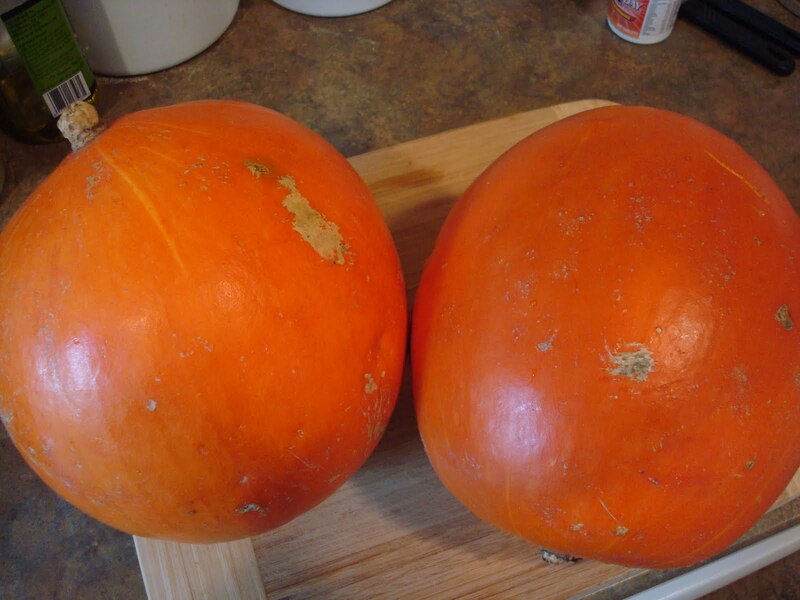 These two small-ish pumpkins didn't give me a lot of seeds, but if you want to make it a family project and get many hand involved, you could harvest a decent amount. 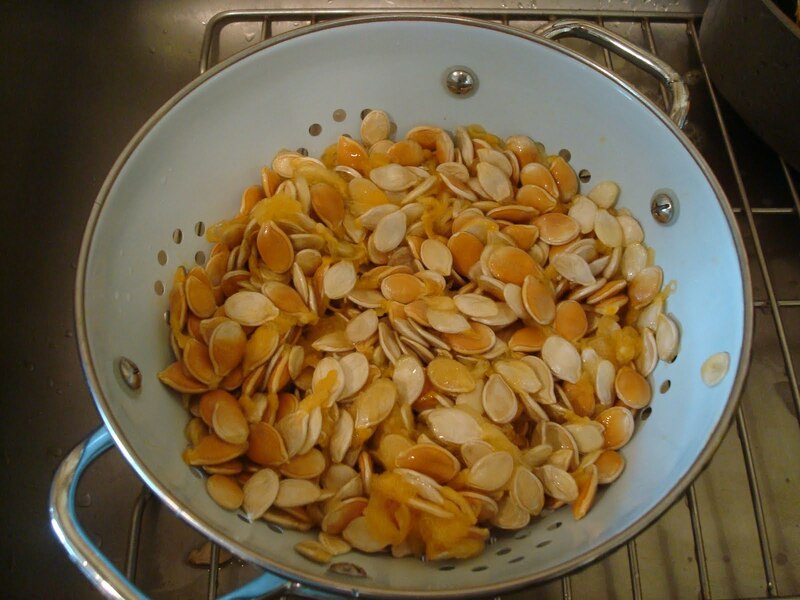 Pumpkin seeds are versatile and can be done as a sweet as well as savory. About 1/2 teaspoon of cinnamon for four cups of seeds, with a tiny bit of salt to accentuate the sweetness of the cinnamon, is all you need. 1. In a separate bowl, mix together the milk, pumpkin, egg, oil and vinegar. Combine the flour, brown sugar, baking powder, baking soda, allspice, cinnamon, ginger and salt, stir into the pumpkin mixture just enough to combine. 2. Heat a lightly pan over medium high heat. Pour or scoop the batter onto the griddle, using approximately 1/4 cup for each pancake. Brown on both sides and serve hot with syrup or powdered sugar. hi,just was copying down the recipe and wondered if the griddle is suppposed to be lightly greased. It depends. Mine is no-stick and needs only a little spray of grease every few pancakes or so. Whatever you normally do for pancakes should work fine. Yummm! On the seeds and the pancakes! How in the WORLD do you find time to do these things when your house is in the same shape as mine... a construction site? You are a true inspiration! Your are not the only one who doesn't understand food politics. I sure don't. Thank you for sharing another wonderfully sumptuous post. Double yum!! I guess now is the time to get the seeds going. I've never done anything with the innards though ~ pancakes you say?? I'd try that in a heartbeat. I like anything pumpkin ~ then do you use the pumpkin shell as a flowerpot or something creative?? That would be cute, wouldn't it? Thanks for the recipe ~ can't wait to make them. What about pumpkin whoopie pies - ooooh, that would be fine! Saloma- All I can say is, the kitchen has not been demolished yet. But there will come a day when we will have to tear into it and then things will really be difficult! Beth- Oh please. Pumpkin whoopie pies were made and eaten already. :-)You know those don't last! 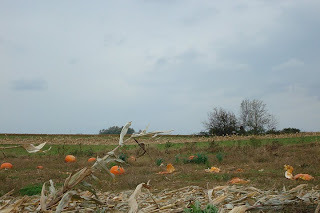 And the pumpkin peel is already compost. I forgot what you told me last year about these pumpkin seeds. Do you eat the whole seed, as it looks in your photos, or do you have to crack them open and eat the little bit inside? BAT Mom- Whole seeds. No seed-cracking prep work needed, they're delicious whole. We have plenty for both though. I am going to try them. I'll let you know what happens. Hmmmm from China you say? Sounds scary. It's hard to imagine they'd need to bring in pumpkin seeds from anywhere. That is a bit confusing. OK pumkin whoopie pies sound really good. I'll have to try making some for work... not for home 'cause I'd eat them all... yikes. Thanks for sharing yet again another great idea.